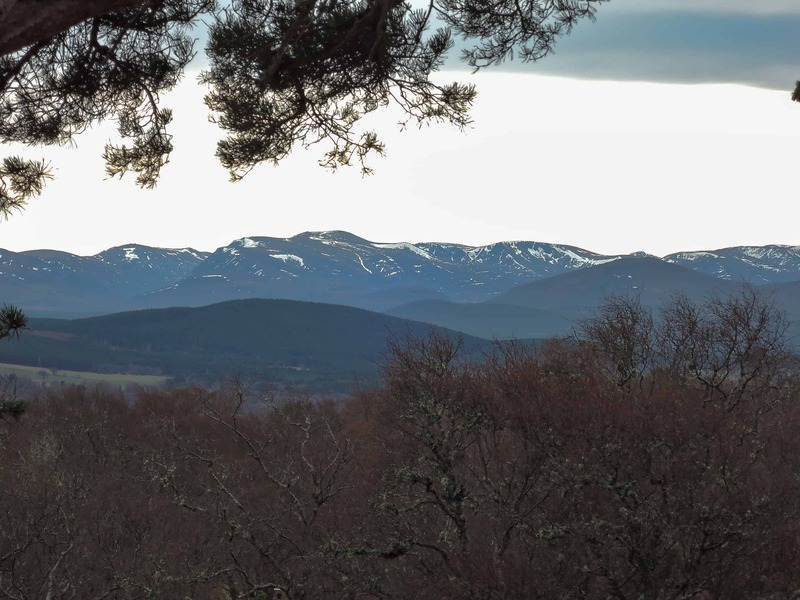 Winter or summer Cairngorms are always a good choice for enjoying the outdoors. We planned to do some winter climbing but the weather wasn’t in our favour. One would think that in late February hiking will require crampons and axe but the snow was long time melted and temperatures well over 10C. The journey to north Scotland is long and tiring if you are coming from London. The flights to Inverness are shorter but land late in the day so not very convenient. We opted for the night train to Aviemore and left straight from work. The cheapest tickets are seated for £100 return from Euston station. Not very comfortable and quite cold. It wasn’t fully booked and managed to move around and stretch our feet on the front seats. Still ended up with a back pain and would wake up at every hour. Apparently the best way is to crawl in the fetus position onto two seats. 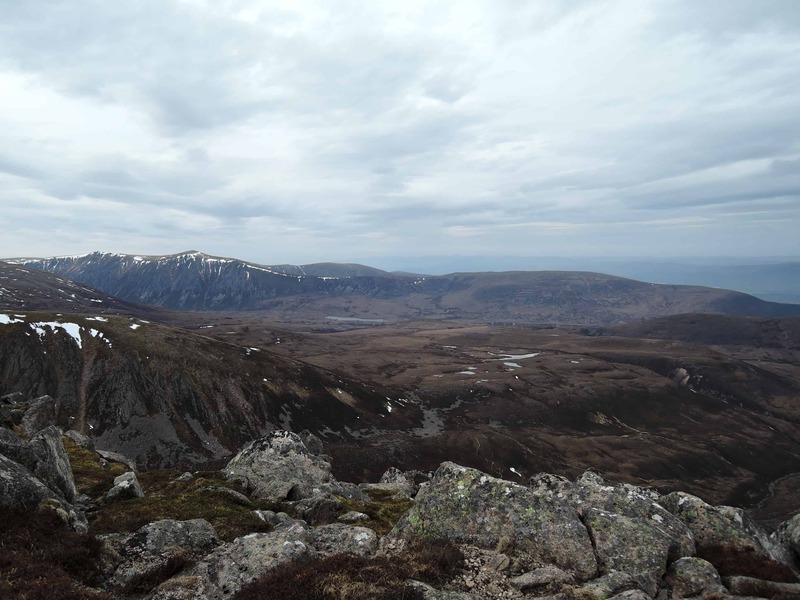 Train arrived just before 8am and three hours later we started our approach to Coire an t-Sneachda. Sadly enough the snow was almost entirely melted and way too warm for climbing. 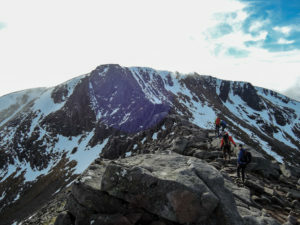 We ended up scrambling up a dry Fiacaill Ridge and topping out in high winds after a short time. Returned in town disappointed and angry to have missed the winter season. 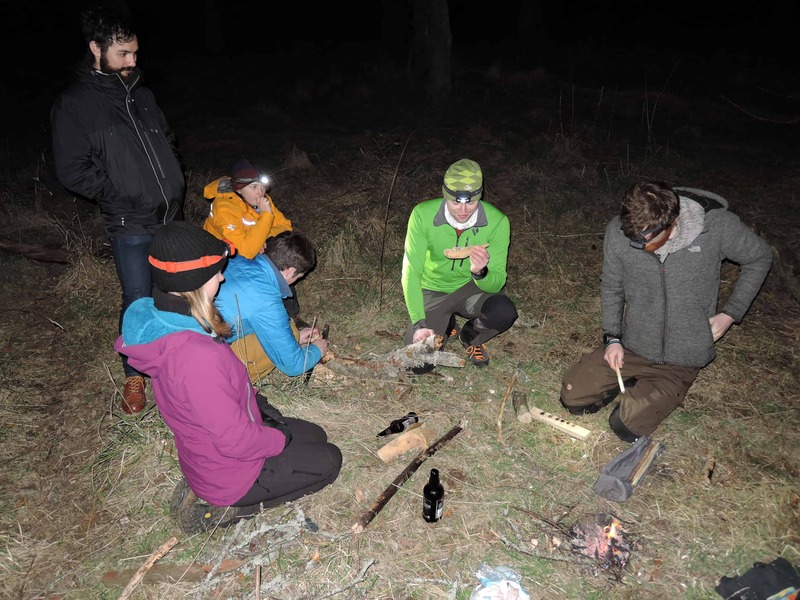 The next days we focused on summer like activities as it was clear that is nothing left to climb in the mountains. 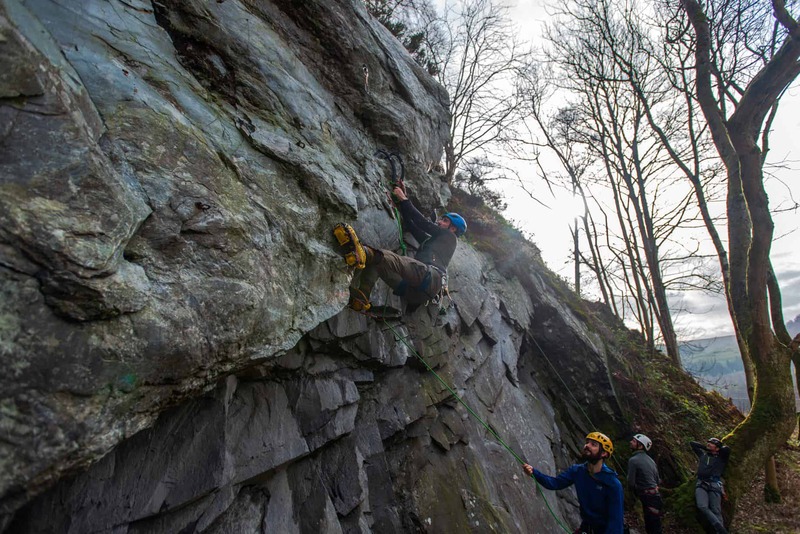 Birnam was a second day choice to test the new BD Reactors on dry tooling. After an hour and a half train ride and £30 lighter on my wallet we arrived at Dunkeld & Birnam station where we got picked by a Rob’s van. 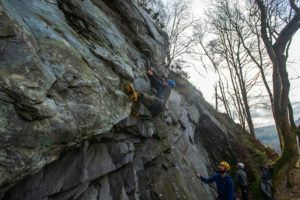 The climbing venue is 10 minutes away and you can park at a lay by. There are a few routes M3-M6 for less experienced and harder ones in a cave uphill from the main walls. 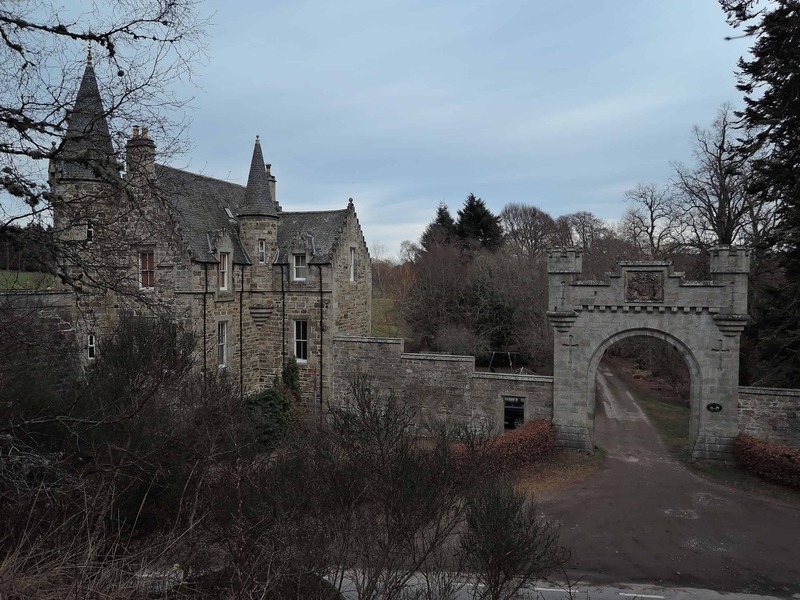 Unfortunately the Glenmore Lodge was also there and got a bit crowded. 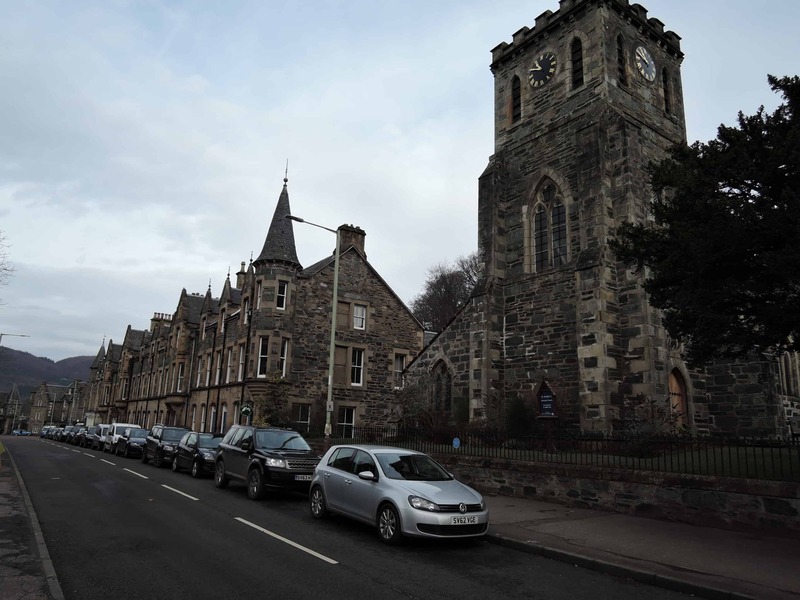 Newtonmore. 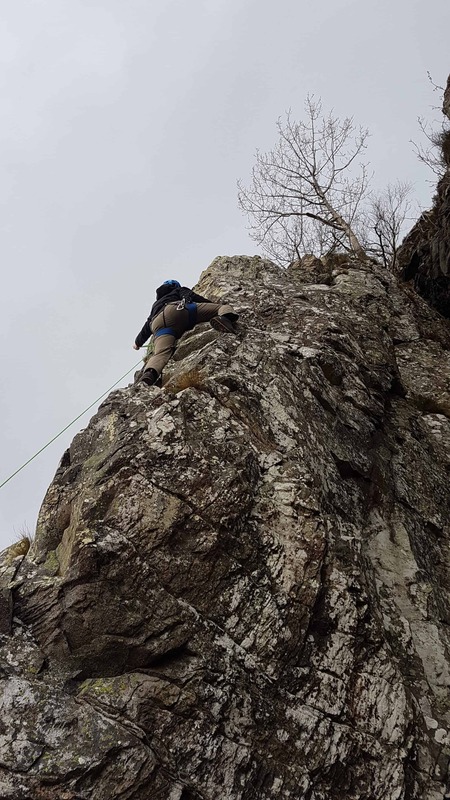 As none of us were keen to spend another 3 hours to Birnam and back, we decided to try some single pitch trad. After a short car ride we arrived and parked on a lay by just across the lake. Go through the wooden gate and follow the grassy path uphill. 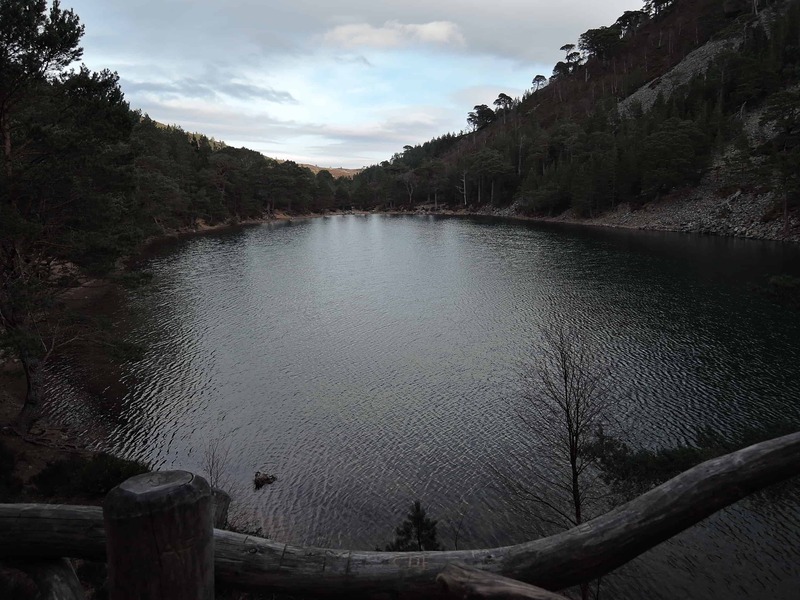 We stopped at Creag Dubh and set up a few top ropes. Rock climbing is not my first choice to say the least. 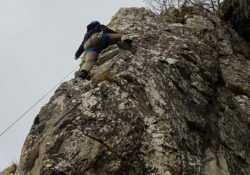 I did manage to climb my first VS in approach shoes and almost finished a HVS. We had good fun but had to retreat because of the wind and rain. We spent the evening bush-crafting. Turns out that making a fire with a bow drill is not as easy as it looks. 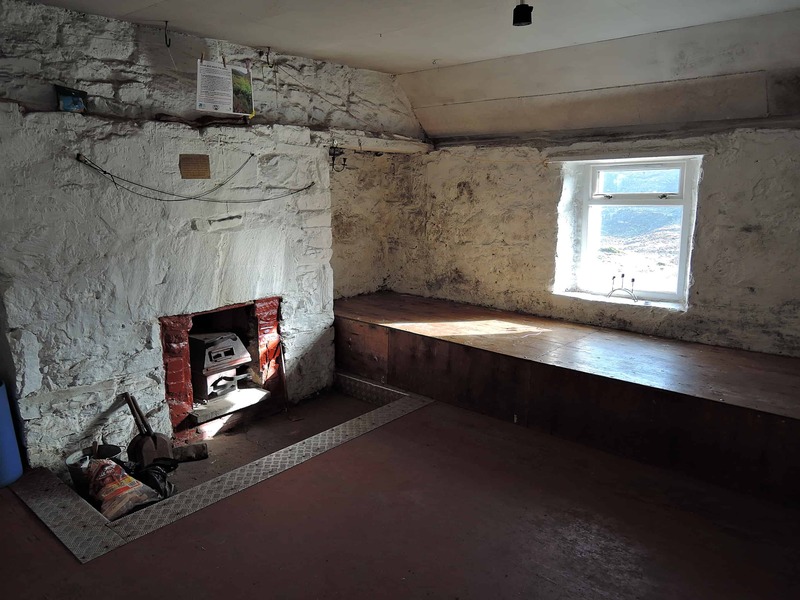 Huntly’s Cave. The next day we drove down to this beautiful venue, more of a cliff with several 10-30m routes rather than an actual cave. 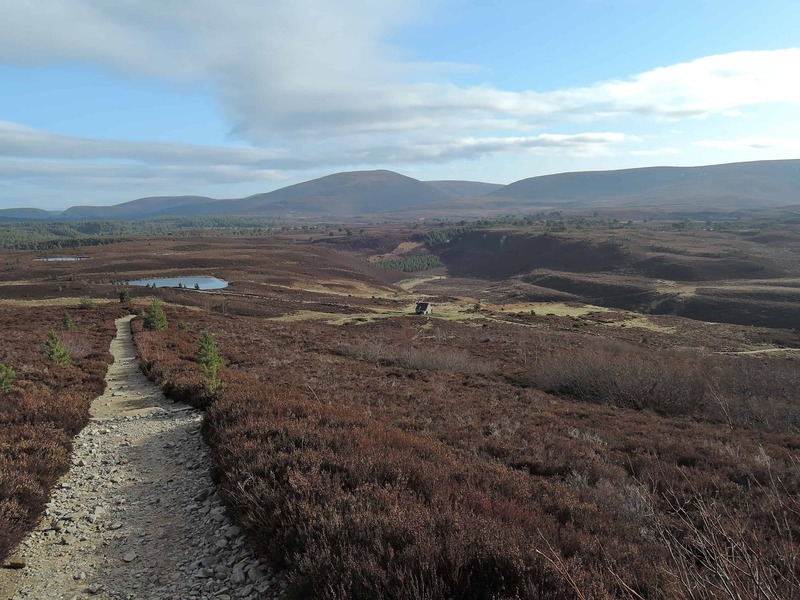 After the first climb I got bored and decided to go for a walk following the Dava Way to Grantown on Spey. It’s an interesting landscape and a nice little walk. Before arriving in the town I changed directions and headed uphill for a panoramic view. We would finish most of the nights around the table in Charlie’s house playing Banangrams and drinking beer. After the first days everybody else went back to their homes and I was left alone. It’s a shame not to take advantage of the good weather and mountains when you’re about to return in a big polluted city. Hiking alone gives you time to relax and discover yourself. 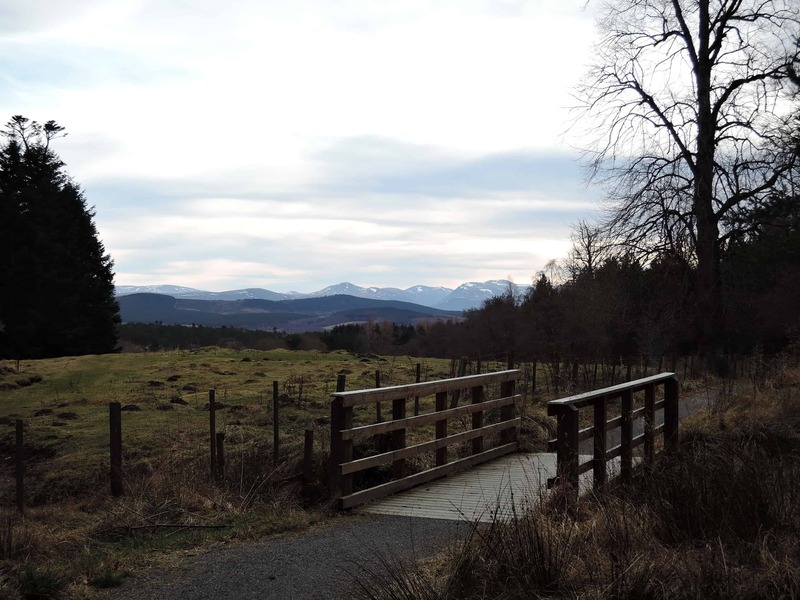 The trail starts and ends in Glenmore, accessible from Aviemore within 15 minutes by public transport. Start at the Reindeer Visitor Centre taking the paved road uphill to a junction and continue right on the forest road. The views are not that great as massive deforestation is currently underway. Soon you reach a bench with a viewpoint and continue downhill on the now narrower path into the woodland. Well defined path takes you to a series of wood platforms over streams and to the bottom of the valley. At a junction one can rest and relax at the shores of Loch Uaine . 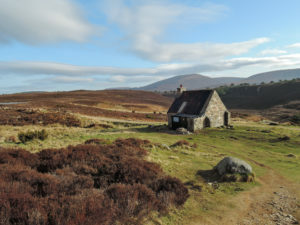 Continue uphill on well defined bike track and keep straight at a junction to arrive at Ryvoan bothy. 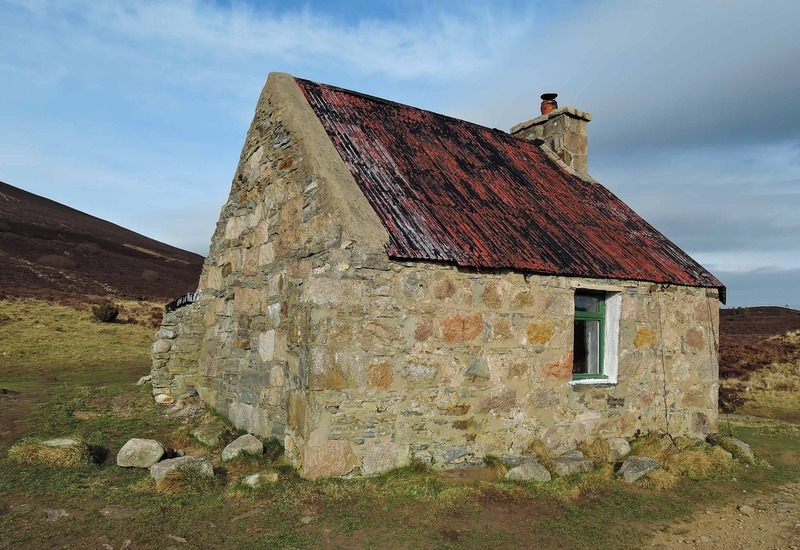 Well maintained and clean, one can have lunch inside, which I did, but only use in case of emergency and respect the bothy code. From here turn sharp left and uphill on a clear and constructed path. 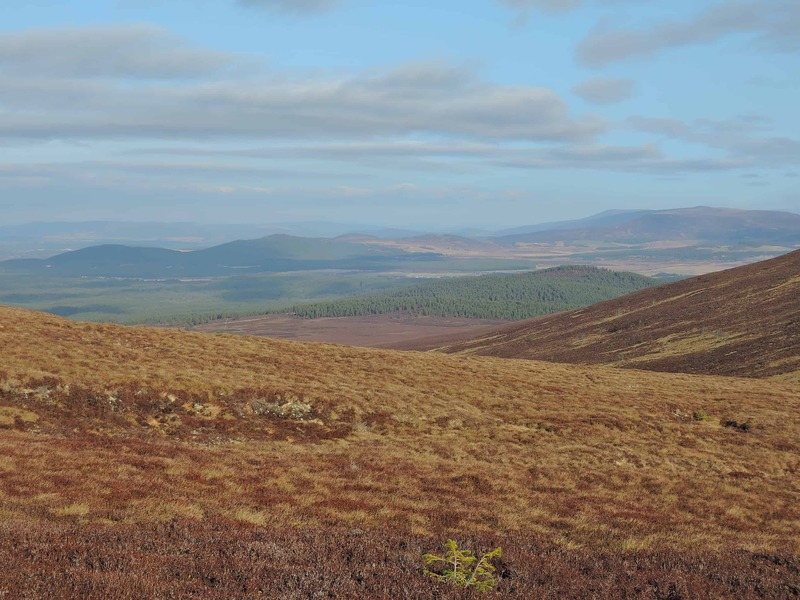 This climbs steadily and steep at times giving way to great views over Abernethy forest, the largest native area in the UK. 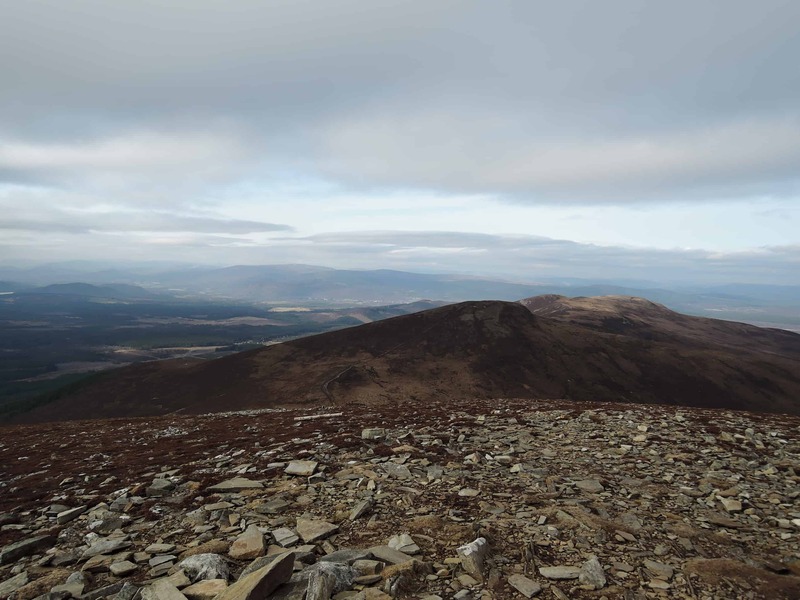 The summit of Meall a’Bhuchaille is marked by a wind shelter and offers good views to the Cairngorms. 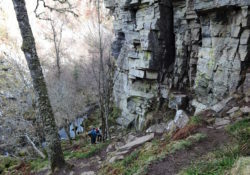 Continue along the path and turn left at the junction if you wish to descent. Alternatively follow the ridge line to extend your hike to Creagan Gorm and Craigowrie. The path here is not so clear and at times quite boggy. 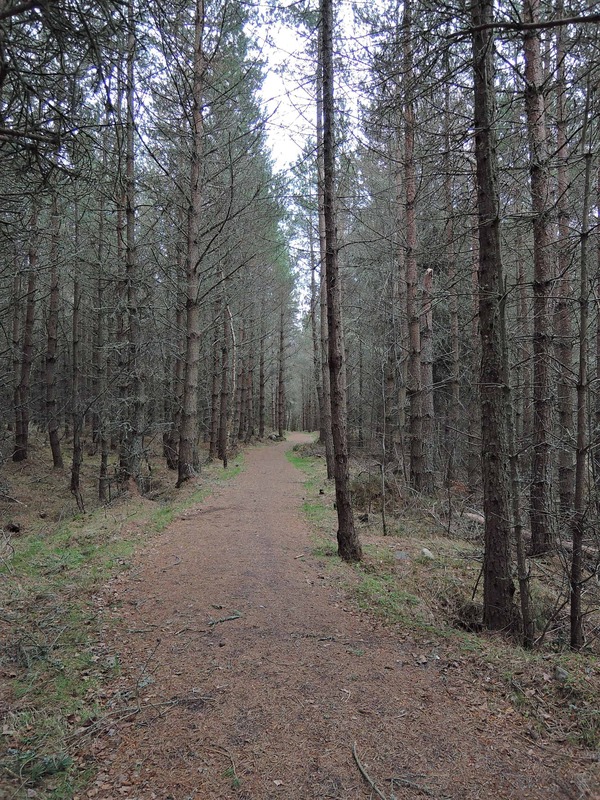 From the last summit drop to the left to the forest line on a muddy path and after on a clearer trail through the trees. Finally reach a bike track and turn left to Badaguish and then Glenmore. 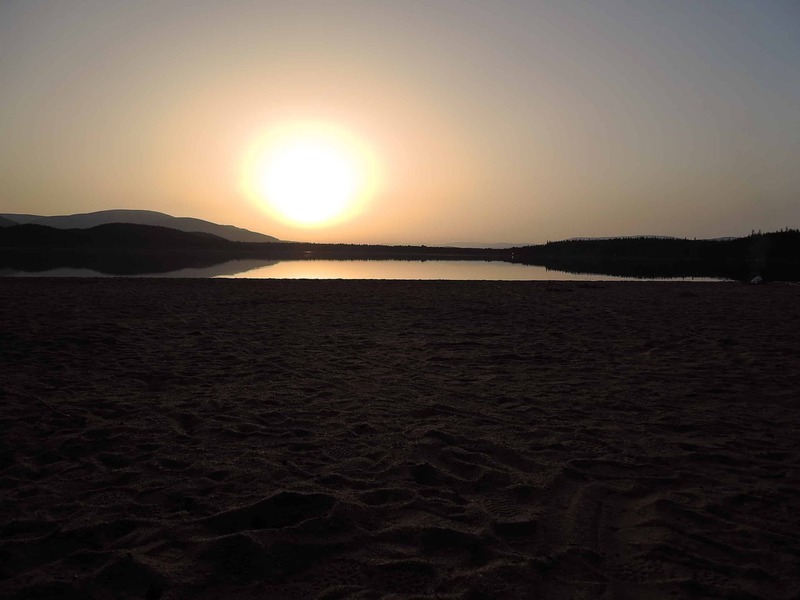 End the day watching the sunset on the shores of Loch Morlich and catch the last bus back to Aviemore. 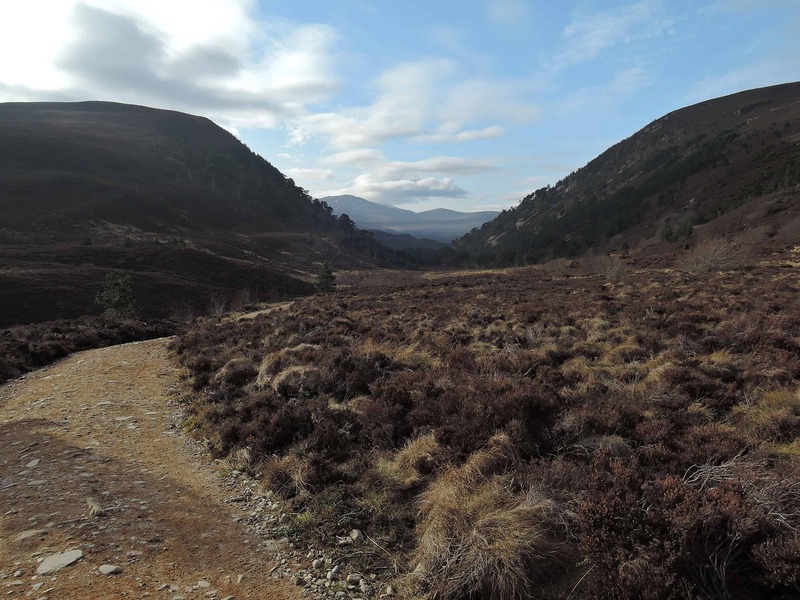 Another fine hike around Aviemore with public transport access and enough time to catch the last bus back. The start of the route is normally the car park at Sugarbowl but the bus doesn’t stop there anymore. 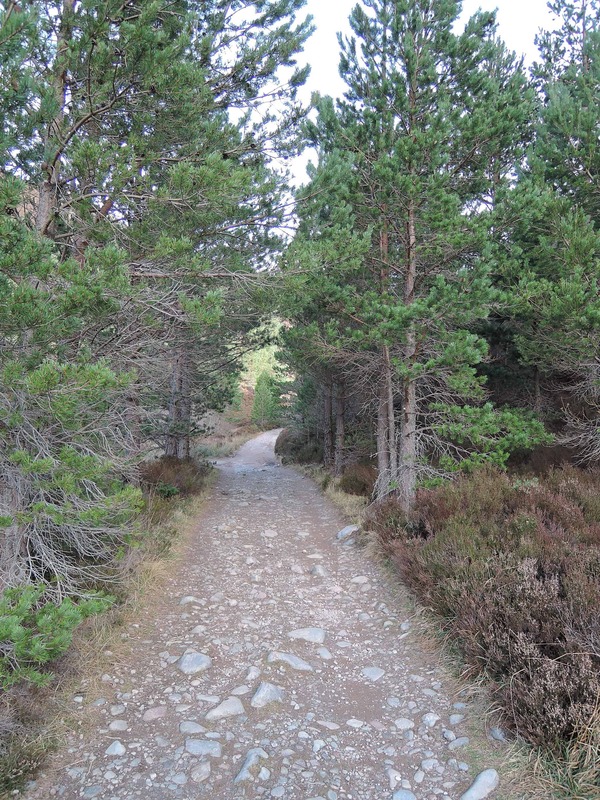 Glenmore is a second choice and doesn’t alter in any way the original route. From the bus stop continue ahead for a few minutes to reach a lay by on the right and a big brown sign with “Cairngorms”. Turn left into the woods and follow the clear path. Cross a bridge and turn right to follow the river upstream. After a series of wooden platforms the land clears and joins the track that comes from the Sugarbowl. Cross the Utsi’s Bridge over the Allt Mor and continue uphill on steep track to reach the reindeer enclosure. 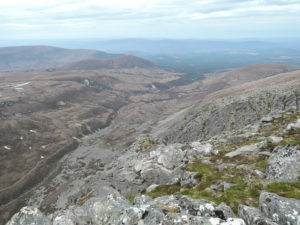 By now you should have a good view over Glen More and the Northen Corries. 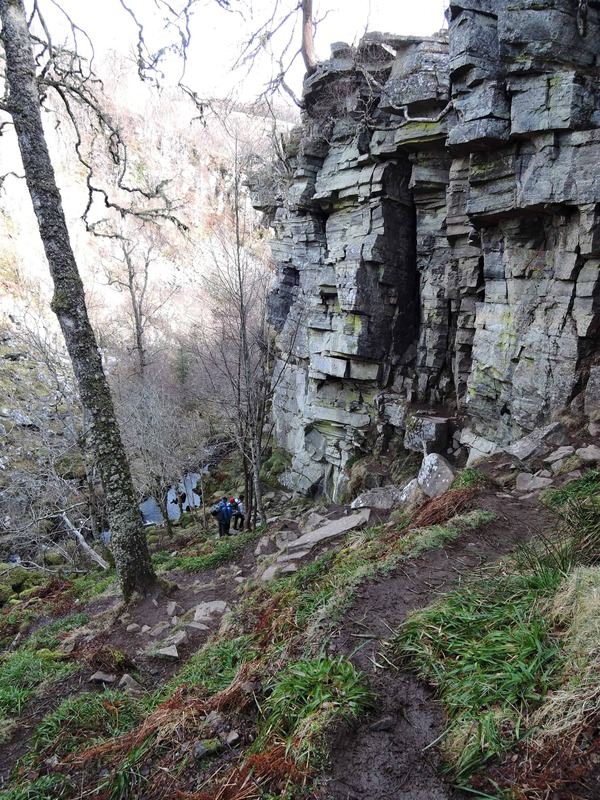 Follow the well maintained path heading into Chalamain Gap, a rocky defile that requires a bit of scramble to get through the other side. 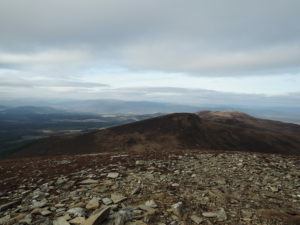 Personally I decided to take a small detour and headed right to the higher plateau to reach Creag an Leth-choin. 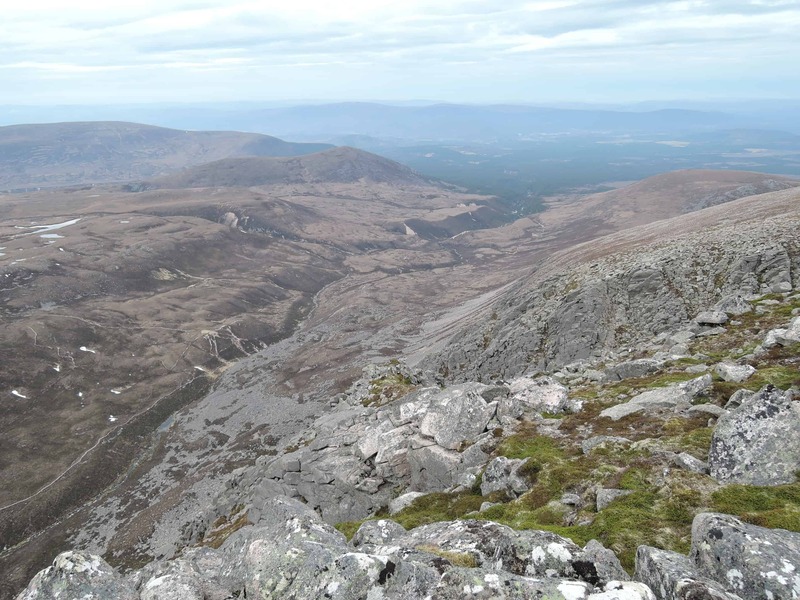 The thought of bagging a Munro sounded more appealing to me than a narrow pass. The terrain is rough and strong foothold is required. There is no path so choose your steps wisely. Sometimes what seems solid might end up being a sinkhole. It can be very boggy after rain. I eventually reached the plateau and realised the actual summit is much further away. It’s a strenuous hike as jumping from a rock to another requires extra care. A lot of them are unstable and can break an ankle just like that. With a layer of fresh snow this is a mine field. The wind was insane and temperature dropped considerably. I finally managed to reach the top and retraced my steps to the edge of the plateau. Coming down I decided to avoid the last rocky part and went downhill heading West towards the track on the other side of the Gap. In moment like this you wish for boots rather than shoes. 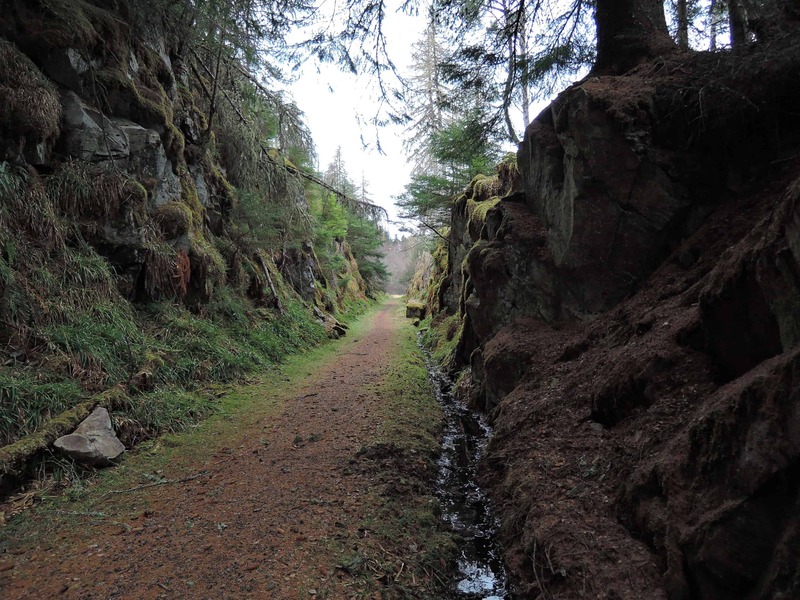 Eventually I managed to get back on the path and continued SW into the Allt Druidh burn. Don’t cross the stream but follow it downhill staying on the right bank. 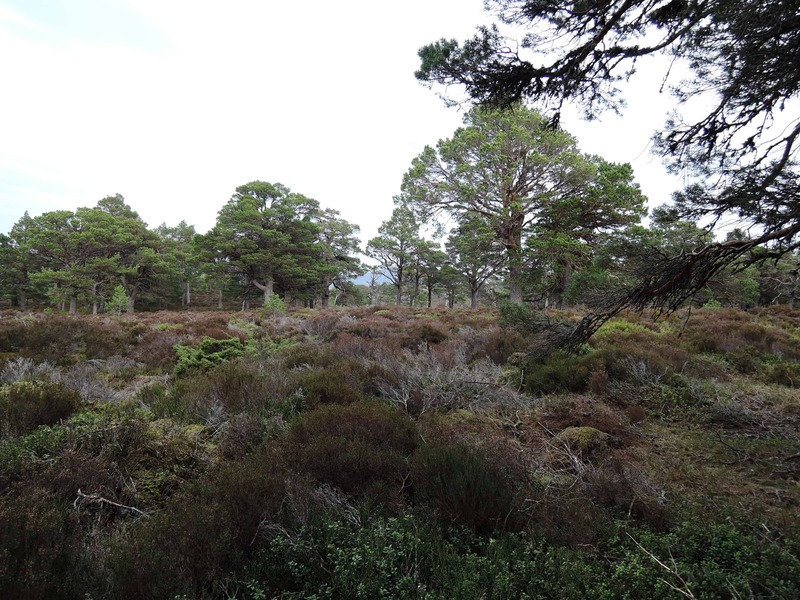 After a few kilometres it reaches the pine forest line. Continue on the unpaved road ignoring any adjacent roads. 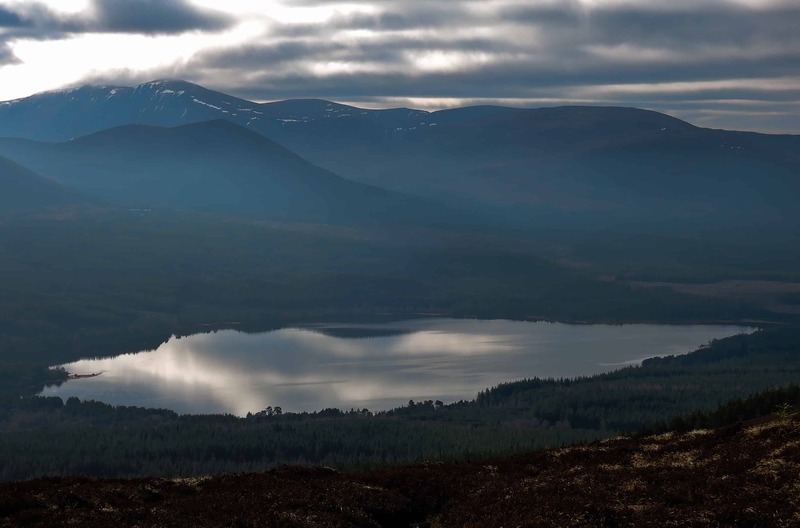 At the sight of Loch Morlich turn right and follow the narrower path. 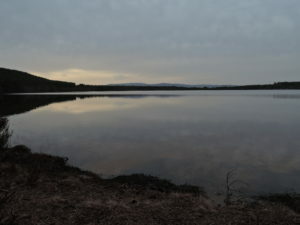 Further ahead, at a bench it is possible to drop down to the lake. I took my stove out and cooked. Lovely way to finish the day. Continue to reach the end of the lake and bear left to the camping site and through to finish at the bus stop in Glenmore. However if you parked at the Sugarbowl, then continue straight leaving the lake behind and to the main road from where I’ve started. It was definitely not the winter climbing holiday I hoped for and I still have a bitter taste for missing the season but for sure we had fun. 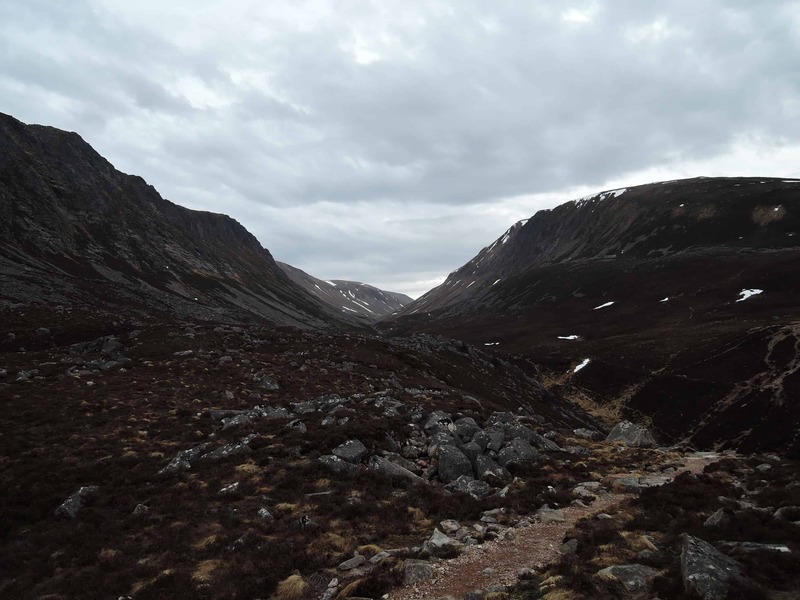 The Cairngorms National Park has some fine hikes and it was nice to enjoy warm weather without being eaten by midges.